Until the internet, I didn't like April Fool's. I'm gullible. I admit it. Even though I was prepared for April 1, girded loins and all, I fell for a lot of crap. I dreaded it and eventually just ended up disbelieving anything I was told. By friends, family, co-workers, didn't matter. I was an easy target, and everyone knew it. 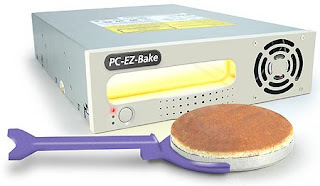 Fast forward a few years, and now April Fool's Day means funny gags from website makeovers to wacky products. I still have to think, "Wait, is that a real product?" sometimes, but that's much better than thinking I'm going to have another sibling. Yeah, my parents were mean sometimes. It had to be hard to top the infamous Tauntaun sleeping bag from ThinkGeek last year. I assumed it was a real product. Why wouldn't it be? The news that the Tauntaun bag was so popular that ThinkGeek actually manufactured it was amazing and hilarious. Now when they come up with April 1st gags, I wonder if some part of product development is thinking, "Can we really make this if fans love it?" 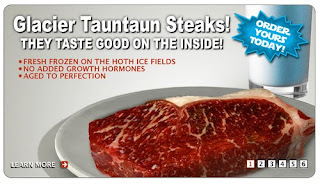 Tauntaun Steaks from Things from Another World. 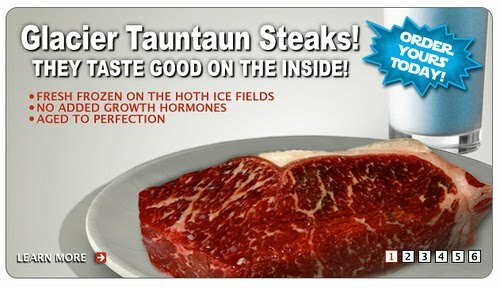 For just $65,000, you can get your very own filet from Hoth. Make grill marks with your lightsaber. It's the other other other red meat. @DarkHorseComics presents a never before seen or heard of comic: Joss Whedon's Happy Endings. You've never seen it, ever. PC EZ-Bake Oven from ThinkGeek. This will fit right into a drive bay and can cook any "tiny or flat food." It even comes with a mix of dehydrated, caffeinated meatloaf. Mmm. Hey, it looks pretty perfect for gaming and Pop Tarts. I'm just saying. Battle.net Matchmaking - Find someone to pwn noobs with. - I don't think I need to say anything else. I like this geek version of April Fool's. Even CNET realizes that Geeky in-jokes dominate April Fool's Day.